handgun at a public demonstration? 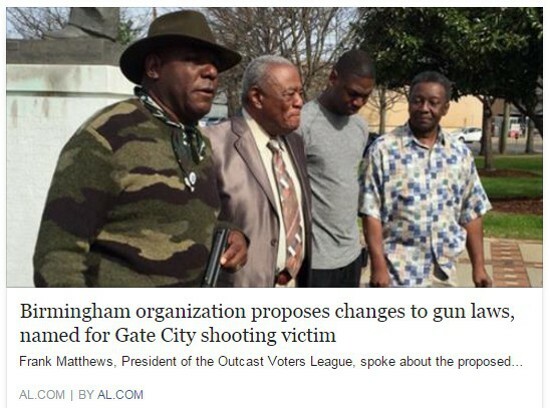 "Birmingham organization proposes changes to gun laws, named for Gate City shooting victim," AL.com reports. "Frank Matthews, President of the Outcast Voters League, spoke about the proposed Sheri Williams Mandatory Gun Changes Act, named for a woman who was killed in Gate City by a stray bullet in 2013. Williams was holding her 10-day-old baby as she was shot." to get people feeling, not thinking. And naturally, none of the gun laws being proposed would have made a bit of difference in this case. Just as naturally, the obligatory opportunistic oath-breaking politician made sure to get his mug in front of the press conference cameras. State Rep. John Rogers used the coverage to make noises about "fashion[ing] a bill that's passable." Considering what they want, that's not likely (at least until the vote in Alabama becomes overwhelmingly "progressive," something the "immigration" and "amnesty" crowd is working on). Outcast leader Matthews could not resist showing off his big "but."